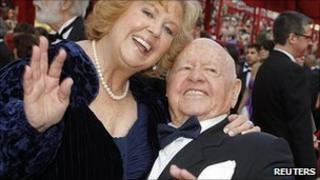 US actor Mickey Rooney has been granted a temporary restraining order that requires his stepson to stay at least 100 yards away from him and his home. Lawyers for the 90-year-old star allege that Christopher Aber, 52, has been "verbally abusive" to him. Court documents claim that Mr Aber "threatens, intimidates, bullies and harasses" the former child actor. Rooney is "effectively a prisoner in his home", the order - approved by a Los Angeles judge on Monday - states. Mr Aber is the son of Rooney's eighth wife, Jan Chamberlin, whom he married in 1978. According to court documents, he has allegedly deprived Rooney of medication and food and has confiscated his passport and other identification cards. "Mickey is extremely fearful that Chris will become physically threatening against Mickey and may even attempt to kidnap Mickey from his home," the actor's lawyers said. Rooney also accuses Mr Aber of forcing him to make personal appearances and sign financial documents without reading them. "All I want to do is live a peaceful life, to regain my life and be happy," Rooney said in a statement. The actor, who rose to fame as a child star in the 1930s and 1940s, received an honorary Oscar in 1983 "in recognition of his 50 years of versatility".